The year 2013 will be the one in which shipments of tablets running Google's Android operating system will pass those of Apple's iPad, according to a new analysis out from IDC. IDC's newest report sees smaller, lower-priced Android devices accounting for 48.8 percent of total tablet shipments for 2013, while Apple's iPad will slip from a 51 percent share in 2012 to 46 percent. Tablets running Microsoft's Windows 8 and Windows RT operating systems are expected to account for 2.8 and 1.9 percent of 2013 shipments, respectively. The report also forecasts tablet market share for 2017, revealing somewhat positive news for Microsoft. 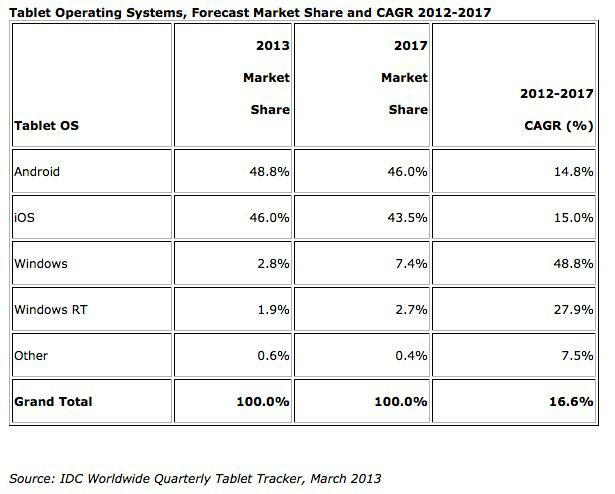 By 2017, Windows 8 tablets may achieve a 7.4 percent share, while Windows RT tablets should hold 2.7 percent of the market. This share would come at the expense of both Android and iOS tablets, dropping them to 46 and 43.5 percent shares, respectively. While Windows RT's share is projected to grow, the report is less than kind on the operating system's overall outlook. "Long term," says IDC Research Director Tom Mainelli, "we think Microsoft and its partners would be better served by focusing their attention on improving Windows 8." Notably, the analysis does not break out Amazon's Kindle Fire line of tablets from the larger Android set. The Kindle Fire line, running a forked version of Android, does not rely on Google services and thus is usually listed in a separate category from devices from Asus, Samsung, and other Android manufacturers. This latest IDC report shows the continuation of a trend that has seen the tablet market growing more crowded with time. The report, though, focuses on tablet shipments, which are not necessarily equal to tablet sales. It is difficult to calculate how many tablet devices are in the hands of consumers, as Apple remains the only manufacturer to regularly report its tablet sales. Other analyses that approach the issue from a usage standpoint show Apple with a commanding lead, despite the growing number of Android tablet shipments. Most recently, Chitika Insights saw Apple's iPad devices accounting for 80 percent of tablet web traffic, with no other devices holding a double-digit share. Chitika's analysis drew on impressions from more than 250,000 websites, but the firm left open the possibility that Android tablet buyers are using their tablets differently from iOS users.